To capture attention you have to replace the thought inside a person’s brain with something more interesting. And if you want to retain attention you have to continue surprising the part of the brain that anticipates the predictable. What does our brain actually find interesting? New. Different. Surprising. Salient. When you’re crafting advertising, filter the boring material out. Is the product new, or different? This could be a good starting point for crafting your message because people are attracted to novelty. 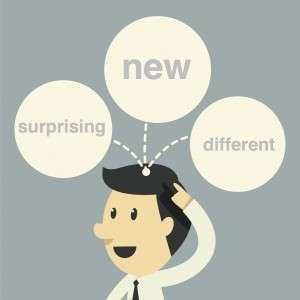 If your product isn’t new or different, you can surprise your audience with language that jolts the brain’s robust anticipation area. You’ll notice I didn’t talk about salience. That’s because salience creates a mental shift that primes people for your message and takes less dynamite powder packed inside your new, different, or surprising advertising. If I’m in the market for a mattress, the topic is salient. Ever bought a new car and noticed your model is everywhere? That new Mazda didn’t matter – it wasn’t salient – until you bought one. The same thing happens when people start sleeping poorly due to a mattress that needs to be replaced. Mattress commercials all of a sudden take on new importance. At this point you may be thinking, “Well, if I can just attract the people who are in the market for a mattress – those customers who find it salient – I’ll make a lot of money.” Nope. Wrong. Think about your audience’s actual buying experience. They have very little loyalty to retailers or brands. They’ll begin doing some research online, pay closer attention to television ads, and read the circulars. When they find a mattress that looks like a fit, they come into the store to check it out. This is not a good scenario and here’s why: when someone is suddenly ready to buy, you have to put your advertising in front of her face first, staying top-of-mind, or risk missing that customer seeking out your store. Do you see why retailers are always advertising? If you don’t have huge budgets and the other mattress store is always advertising, it’s seems like there’d be no way to gain market share without bigger budgets. That’s incorrect. There is a way. First, you need to replace the thought in your audience’s brain with something buzz-worthy that’ll fire the synapses, a thought more interesting than what they’re thinking. Chuck Palahniuk-style writing. Here’s a quick exercise on arriving at a surprising idea. 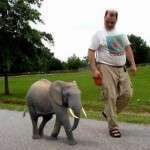 I have a pet elephant. I am having Ryan Gosling’s baby. Now that I’m having Ryan Gosling’s baby, my financial future is more important than ever. And that’s why I turned to Acme Financial. This is my pet elephant, Ronnie. He was only a dream, until I built my portfolio with Acme Financial. Now, every day is like a magical circus performance in my backyard. See how easy that is? Random Sentence + Your Business = Surprising and Different. Even if you don’t end up using this approach in your advertising, do the exercise because it’ll help you get out of that bland advertising rut. Enjoyed the article, Mark. Those are very practicle tips to help people make their product or service stand out in the marketplace.